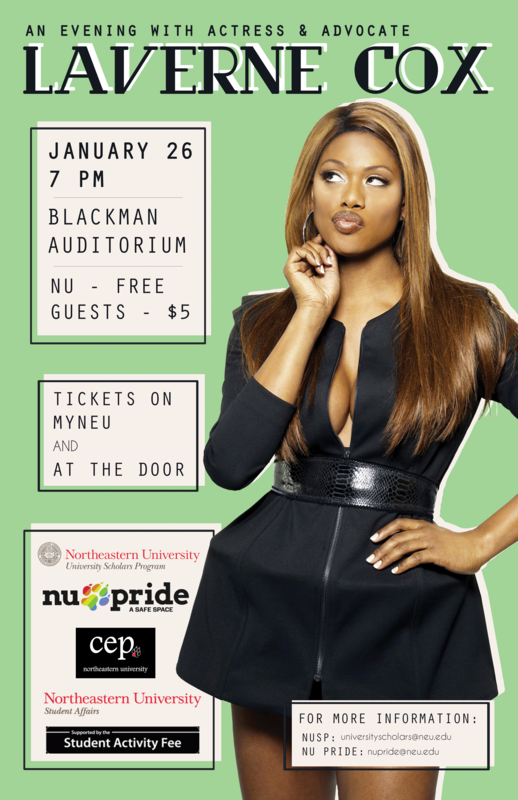 In collaboration with Student Affairs and NUPride, the University Scholars are pleased to welcome actress and LGBT advocate Laverne Cox to Northeastern. Tickets are available for free to Northeastern students, faculty and staff through the "My Tickets" feature of MyNEU. Cox has also become a vocal and prominent advocate for moving beyond traditional gender expectations, with speaking engagements nationwide and appearances on CNN, MSNBC, ABC, NPR, HLN, VH1, and other national TV and radio networks. Laverne was named one of Out magazine’s “Out 100,” one of the country’s top 50 trans icons by The Huffington Post, and one of Metro Source magazine’s “55 People We Love.” A graduate of Marymount Manhattan College, Laverne holds a degree in Fine Arts. Cox's appearance is part of the Scholars Seminar on Leadership, Research, and Innovation, a semester-long series of events featuring thought leaders and change makers from both inside and outside the university.